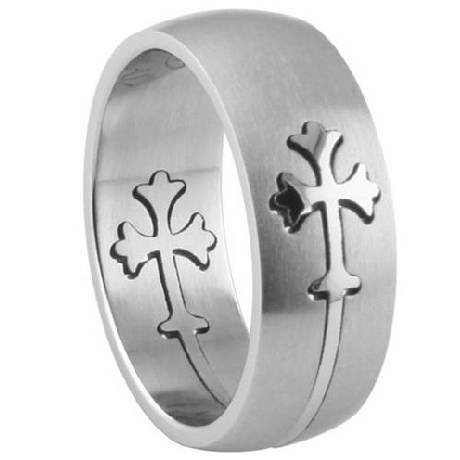 For men who want to wear a ring that symbolizes their Christian faith, this 8mm laser-cut ring is one of our newest and most unique men's cross rings. With a slightly domed profile and a matte satin finish, it features a shiny grooved line that connects the two polished crosses. Whether worn as a fashion ring or wedding band, this beautiful 8mm stainless steel ring makes an elegant statement. Beautiful elegant design, and quality material. Floating centre piece is unique. Extremely satisfied. This ring is really quite nice. Quality materials and exceptional craftsmanship.